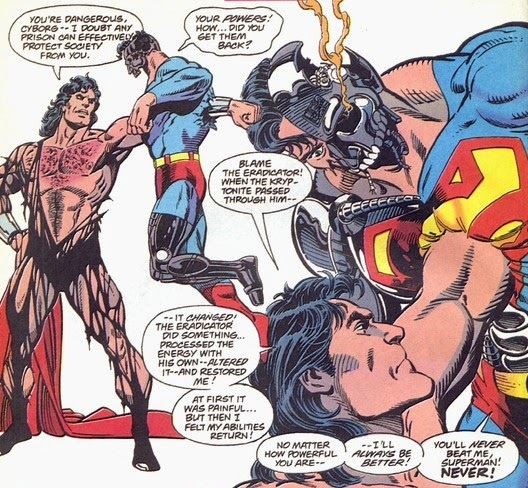 Summary: Superboy meets Eradicator outside of Engine City. Inside, the heroes regroup and face another attack from Cyborg Superman. Eradicator locates Superman and convinces him that he also wants to defeat the cyborg. Cyborg Superman tricks Superman and Eradicator inside the chamber that houses Engine City’s kryptonite power source. Eradicator sacrifices his life, transferring the radiation into a form that won’t harm Superman. The cyborg is weakened by the kryptonite, which enables Superman to smash him into pieces. After he’s reunited with the other heroes, Supergirl uses her telekinetic powers to recreate Superman’s original costume. Revitalized, he flies to Metropolis. The design of Green Lantern’s emerald armor doesn’t match the previous chapter. I Love the ‘90s: Green Lantern’s battered appearance makes Superboy want to "hurl." Gimmicks: Apparently there are foil variants and chromium variants for this issue. Production Note: The title and credits for this issue are missing in the Return of Superman trade. Also, two pages clearly by Tom Grummett (featuring Superman's reunion with Lois) are added at the end of this issue. I’m assuming they’re from Adventures #505, which the inside front cover claims to reprint but is otherwise missing. Review: And we’re still in Engine City. As is the case for most chapters in this arc, as an individual issue it’s decent, but when read in succession with the rest of the storyline, you’re left with the sense that you’re trapped in the third act of a movie that will not end. What Superman has going for it, as usual, is lovely art from Dan Jurgens and Brett Breeding, who go the extra mile and truly sell the scope of Engine City. Since Jurgens seems to enjoy Cyborg Superman more than the other creators, he comes across as a more tolerable villain this chapter. Jurgens throws in a few clever bits during the excessive fight scenes, such as the cyborg possessing Steel’s armor, but there’s only so much that can be done to maintain the reader’s interest in a fight that’s dragged on for several issues. The non-fighting pages seem to be going down a checklist of things that need to be addressed before the story finally ends. Everyone’s brought together, the Eradicator’s heroic arc is completed, and there’s finally some explanation for how exactly Superman’s alive. It’s not a great one, however. The resurrection boils down to Eradicator using Kryptonian technology to make Superman better, then warning him that it was a unique circumstance that could never be repeated. That’s a pretty feeble way of getting around a clear problem with this storyline -- once Superman is killed and resurrected, you’re confirming to the audience that he is immortal. While DC gained all the publicity it could’ve ever wanted out of killing Superman, the resurrection is never going to match the drama that surrounds the death. And once the readers know that DC has no real commitment to killing the character (something any fan older than ten should’ve known anyway), it’s even more difficult to sell the concept of Superman ever being in a life or death situation again. Throwing in a line or two about these circumstances being unique isn’t really going to address these problems. Summary: Green Lantern, enraged at the destruction of Coast City, fights his way into Engine City. He faces Mongul in battle, but is unable to destroy the engine room when he discovers its kryptonite power source, knowing that Superman is nearby. 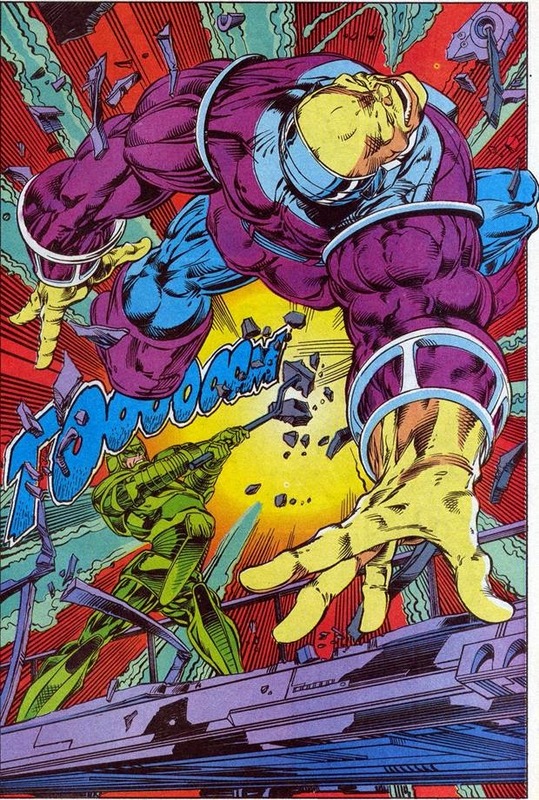 Mongul takes advantage of Green Lantern’s inability to affect yellow and breaks his arm and knee. Green Lantern finds Steel’s hammer and uses his ring to build armor around his body. With the hammer, he beats Mongul into unconsciousness. 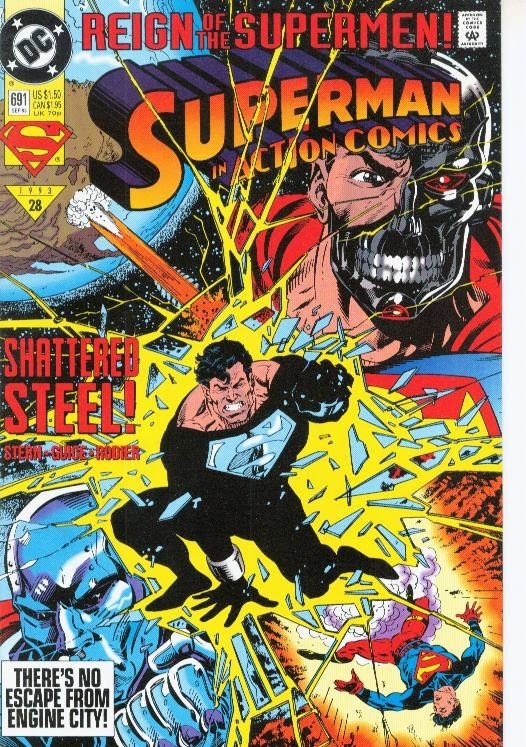 Steel left his hammer behind after he flew Cyborg Superman’s metal form into the engine room’s gears in the previous chapter. Where he is now is not revealed. Mongul is still referring to Cyborg Superman as “the leader” even though Mongul’s turned against him by this point. Green Lantern’s title was going through an awkward stage during this crossover. This is the gray-at-the-temples, drunk driving, renegade Hal Jordan from what I’ve been able to glean from online articles. Total N00B: Green Lantern’s ring is still powerless against yellow at this point in continuity. I was surprised to see that bizarre old rule was still in place in 1993, but then I remembered Ron Marz stating in Wizard that Hal’s replacement wouldn’t have that absurd restriction, so this must be one of the final stories to feature it. 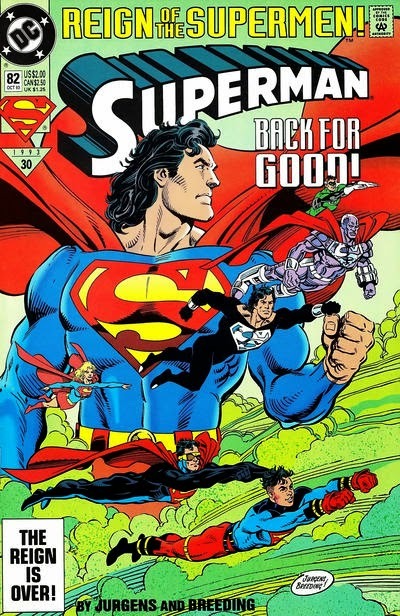 Production Note: The Return of Superman trade only reprints sixteen pages of this issue. Presumably, the rest of the issue deals with storylines that don’t directly relate to the GL/Mongul fight. Review: Green Lantern was thrown a bone and allowed to participate in the “Return of Superman” event, although it’s debatable if this really helped the title in the long run. Within a few issues, the destruction of Coast City will become the basis for Hal Jordan turning rogue, an idiotic decision that DC stubbornly stuck to for a surprising number of years. (Never tear down the existing hero in order to build up your replacement hero.) This issue is mostly dedicated to Green Lantern screaming at Mongul and futilely punching him. Gerard Jones does exploit the basic flaw in the fight’s premise -- Mongul is yellow -- and gets a few entertaining pages out of it. Green Lantern knows he can’t directly hurt Mongul, so he has to use his ring to destroy everything around Mongul, using Engine City as a weapon against him. The action’s staged rather well, and M. D. Bright keeps the fight energetic, but it’s hard to ignore that almost every other page is either a splash page or double-page spread. It’s a quick read, and what passes for “depth” are some melodramatic narrative captions from Green Lantern about his hate fueling his power. It’s not pleasant. 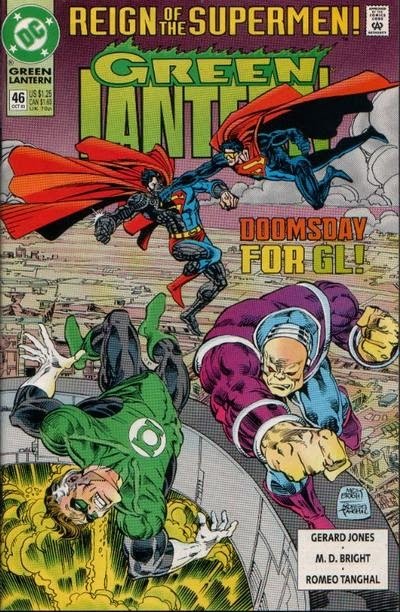 Summary: Superman faces Mongul while Steel attempts to stop the blast that will send Earth out of orbit. Inside the engine room, Steel is attacked by mechanical objects that have been possessed by Cyborg Superman. The Cyborg’s boasts enable Steel to realize that he needs to stop the transformer engine that creates the magnetic fields within the fusion reactor. He destroys the engine, but the kryptonite power source remains. Meanwhile, Mongul discovers Supergirl’s presence and knocks her unconscious. He soon gains the upper hand against Superman. Green Lantern makes a one-panel cameo, as he flies towards Earth and realizes that Coast City is gone. Eradicator also arrives in a one-panel scene. The designs of Superman’s guns and his gun belt don’t match the previous chapters. Mongul wants to destroy the Earth, now that Superboy’s actions have prevented Earth from properly going into orbit and becoming the new War World. Steel unmasks and reveals his secret identity to Superman, who remembers rescuing him months earlier. Steel’s thoughts reveal his mother named him after the folk hero John Henry. Louise Simonson apparently didn’t know that “Man of Steel” has already been renamed Steel at this point, since there’s another scene that has Superman coming up with the name. Review: Oh, wonderful. More fun in Engine City. Judged on its own merits, this isn’t necessarily a bad chapter. Jon Bogdanove’s Steel remains an imposing presence throughout the issue, and his designs for the makeshift Cyborg Superman bodies are imaginatively weird. 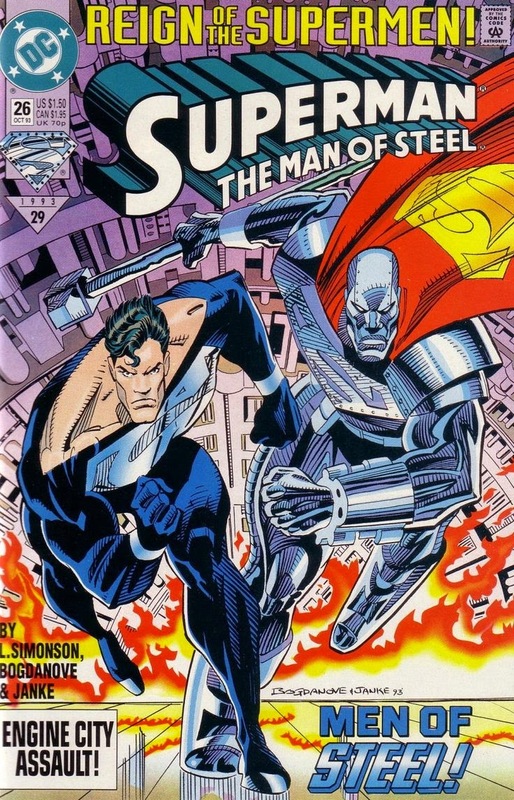 Steel’s lengthy fight scene with the cyborg is also livened up by Simonson’s dialogue, which emphasizes Steel’s intelligence and gives him an opportunity to think his way through a problem. (Something we haven’t seen the heroes do in a while during this arc.) And then there’s…not much else. A few subplot pages of Lois and the utterly charmless Jeb Friedman, a couple of scenes to establish other characters arriving at Engine City, and a few pages of Superman and Mongul in a fistfight. Like the previous chapters, much of the issue is dedicated to checking in on characters or getting them into place for the finale, but very few of these scenes are interesting in their own right. If this didn’t feel like the fiftieth story I’ve read during this Engine City battle, it wouldn’t bother me so much. 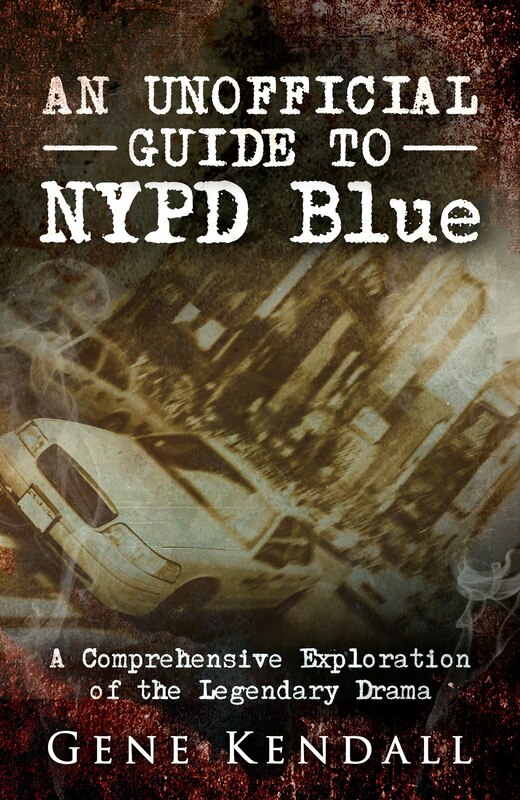 Reading it within the context of the collected edition, it’s another chapter that barely accomplishes anything and just causes the story to drag. Summary: Superman and Steel continue to fight against Mongul and the Cyborg’s foot soldiers. During a break in the fighting, Superman reveals that Supergirl has been aiding them the entire time in her invisible form. However, she’s soon separated from the others during their search for Engine City’s power supply. Mongul declares to his personal followers that he isn’t taking orders from Cyborg Superman any longer. He orders them to start the kryptonite-powered engine, which will destroy the Earth. Meanwhile, Lex Luthor discovers a semi-conscious Superboy, who’s fallen in a landfill after stopping the Engine Bomb. He’s furious that Superboy doesn’t know where Supergirl is. Elsewhere, Eradicator absorbs the Fortress’ energy, nearly destroying it, so that he has the power to return to the fight. Irrelevant Continuity: Superman says he hasn’t felt this vulnerable since Mxyzptlk cancelled out his powers. A footnote points to Superman #49. Mom, Apple Pie, etc…: A series of narrative captions explains that Eradicator didn’t understand the concept of humanity, of complex ways of thinking and feeling, until taking on the form of Superman. Review: Apparently, we needed yet another chapter of this Engine City fight. To his credit, Roger Stern breaks up some of the monotony by throwing in Supergirl’s surprise appearance, and he’s able to portray Superman’s use of machine guns in way that doesn’t feel like gratuitous shock value. The action isn’t necessarily bad, it just feels redundant at this point. There are only so many pages of Superman and Steel plowing through armies of alien goons that I’m willing to tolerate. The only real plot advancement comes from Mongul’s decision to turn on Cyborg Superman, which has been telegraphed for what feels like six months now. The rest of the issue consists of getting the remaining cast members in place for the big finale, which would be a welcome relief right about now; however, it’s still a few issues away. I understand that this story was inevitably going to end with all four replacement Supermen and Superman, along with Supergirl, gathered together for a big fight...but honestly, I was expecting something a bit more creative than this. Assuming a lawyer doesn't have this removed before this post is published...here's a 1990 episode of The Oprah Winfrey Show, featuring her interview with the Teenage Mutant Ninja Turtles, who were promoting their rock album at the time. Pizza-Free Summary: Donatello manipulates the aircar into ejecting the Triceraton. It lands inside the Museum of Natural History and is killed. Horridus is upset, because the Triceraton told her they were both Saurans of “the Master Race.” Later, more Triceratons teleport inside the museum. Horridus mistakenly believes that they’ll welcome her as a sister, and is nearly killed by the Triceratons when she emerges. Meanwhile, Splinter catches Pimiko sneaking into Casey’s home. Casey returns to find Splinter tying Pimiko up. Splinter tries to have a civil discussion with her, but Casey’s abrasive behavior causes Pimiko to flee. Leonardo returns, looking for reinforcements to fight the Triceratons before more can teleport to Earth. 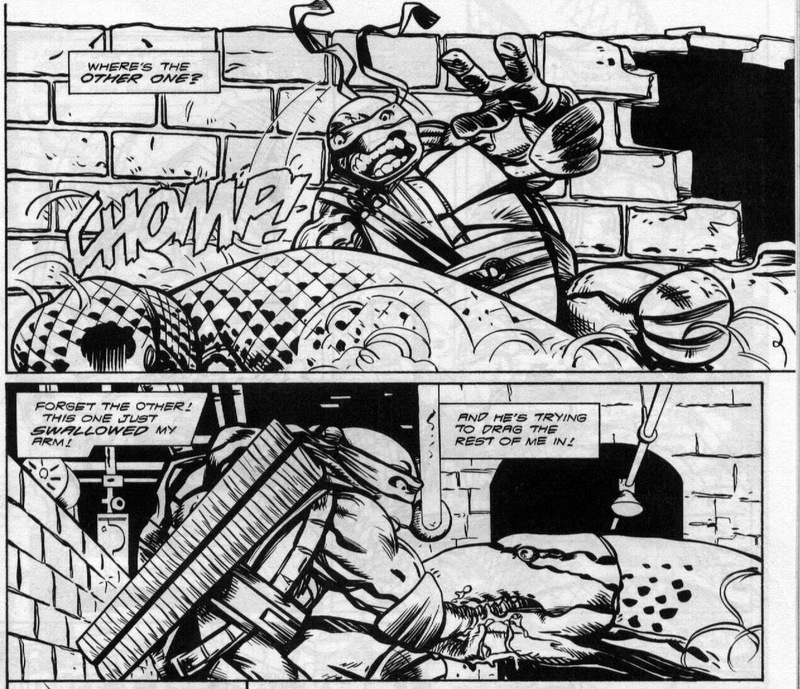 While Casey joins Michelangelo and Leatherhead in the sewers, Leonardo recruits the help of Raphael and the Foot Clan. According to Savage Dragon continuity, Horridus is believed to be the child of a human mother who was abducted by aliens. Horridus thinks the Triceratons can give her information on her past. Raphael’s inner monologue makes clear that he wants the Foot Clan to go straight, but doesn’t have the funds to provide for the group. Therefore, the Foot is taking jobs from their former clients. Review in a Half-Shell: This may be a “middle” chapter, but it’s hardly boring. 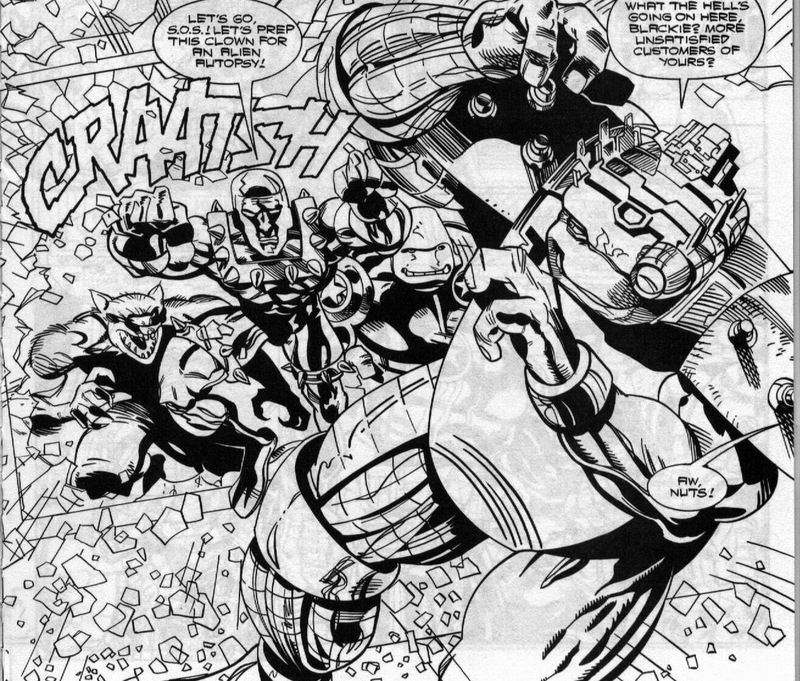 Carlson has managed to take the existing Mirage continuity, the established Savage Dragon cast, and his own ideas and merge them into one of the series’ best issues. Horridus and Leatherhead both make terrible sidekicks for the Turtles (since one is dumb as rocks and the other is insane), which is why it’s so much fun to see how the heroes endure them throughout the story. 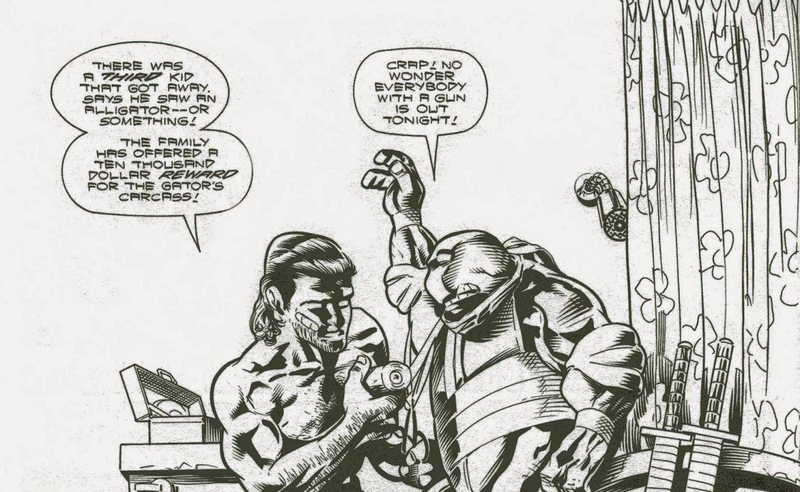 Donatello is continually amazed at just how dense Horridus can be, while Michelangelo is nearly killed by his “ally” Leatherhead for saying the wrong thing near him. Plus, Casey Jones is in on the action, and he’s always reliably nuts. 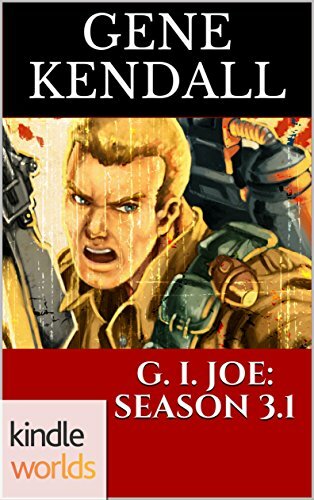 It’s entertaining just to watch the characters bounce off each other, while Carlson keeps upping the ante in the Triceraton storyline and throwing more threats at the heroes. Setting half of the story at a museum is also a clever move, providing one of the best bits in the issue -- the Triceratons just assume that humans killed their ancestors, and that the museum is some kind of monument to their hunt. All that said, the series still has an issue with Raphael. I was relieved this issue to have Raphael acknowledge that he’s trying to guide the Foot in a new direction and do the right thing…only to discover on the same page that the Foot is still involved with criminal activity in order to pay their bills. "Robberies, murders, spying! They're lining up to hire us! Dear God, what have I done?" Yes, Raphael, what have you done? How does Raph go from the loudmouthed, loose cannon of the group to criminal mastermind? Carlson’s premise is absurd -- if Raphael had a true objection to using the Foot for evil (and I think any interpretation of the character says that he would), then why is he compromising his ethics for the sake of a paycheck? These elite ninja warriors can’t get day jobs? The drama is so artificial, and the characterization so utterly off, it’s impossible for me to take this subplot seriously. Pizza-Free Summary: Government agent Mr. Black calls in the S.O.S. to verify that Donatello is not an alien. With Dragon presumed dead, only Horridus is left to recognize Donatello. He’s soon released from custody. In New York, Casey Jones appears on the news to accept his reward for bringing in the “killer” monitor lizards. April gets a phone call from Casey’s boss, who fires Casey for skipping work to chase the “sewer monster.” Meanwhile, Raphael and Splinter debate Raphael’s role as the new Shredder. Elsewhere, Michelangelo and Leonardo spend time with Leatherhead and his friend, the Utrom Dr. X. They agree to repair Leatherhead’s transmat device. Dr. X deviously uses Leonardo as a test subject and teleports him away. When Leonardo returns, he’s followed by several Triceraton Commandos. Leonardo damages the transmat device and retreats with Michelangelo and the others. The Triceratons pick up a homing signal from Zog’s old aircar. A Tricerarton sneaks up on Donatello as he travels in the aircar with Horridus. Dragon is believed dead following the events of Savage Dragon #50. The S.O.S. is the government-sponsored superhero team he leads. Donatello claims that Dragon tried to recruit him for the S.O.S months earlier but he declined. One of the Triceratons is killed during their battle with the Turtles. Horridus is unusually flirty with Don, even though Michelangelo is supposed to be her man. What the Shell? : Casey Jones is identified on the news as “Arnold Jones” for some reason. Total N00B: Raphael claims Splinter is a better grandparent (to Shadow) than he was a parent. Does Raphael have daddy issues with Splinter in the original Mirage continuity? 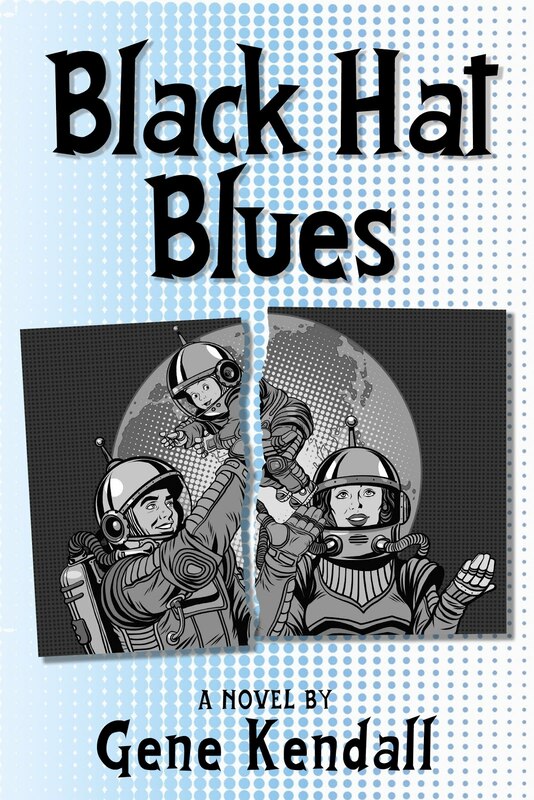 Review in a Half-Shell: The lowercase “men in black” storyline closes, without much of a climax. I like the way Carlson incorporates the existing Larsenverse logically into the story, with Donatello using his brain and calling his civil servant pal for help, but ultimately I’m not sure what the point of the exercise has been. Surely there was an easier way for Horridus to make a return appearance. I suppose the story could have larger ramifications later on, now that it’s been firmly established that the government is aware of the Turtles. As the issue barrels along, Carlson seems to make a point to touch upon every single ongoing plot thread. 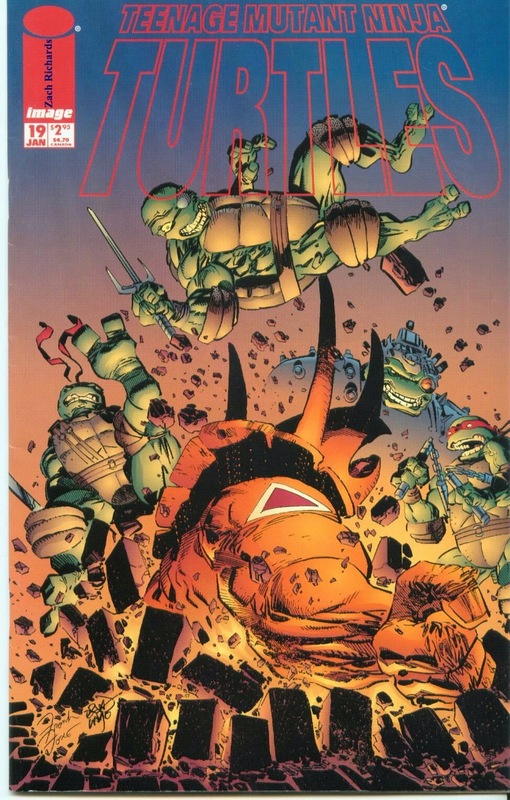 Casey has claimed the reward but lost his job, Splinter and Raph bicker over his association with the Foot Clan, and Leo and Mikey are left to deal with Leatherhead. At least one of my concerns as a reader is addressed, when Splinter points out that Raphael’s decision to replace Shredder is utterly ridiculous. I’m not sure of the specifics of the Splinter/Raphael relationship in this continuity, so I don’t know if Carlson is overplaying the existing hostility, but it’s about time someone in this series points out that Raph’s actions are kind of insane. Carlson deserves some credit for picking up on the Leatherhead/ Dr. X thread from the Mirage continuity and trying to go somewhere with it, and I have to admit that any time the Triceratons appear, I’m happy. I have no real justification for this, but the Triceratons are one of my favorite elements of TMNT canon. I loved their first appearance in the Mirage series (which I initially read in the color First graphic novel reprint), thought the Triceraton action figure was cool, and…don’t remember them doing much in the cartoon. 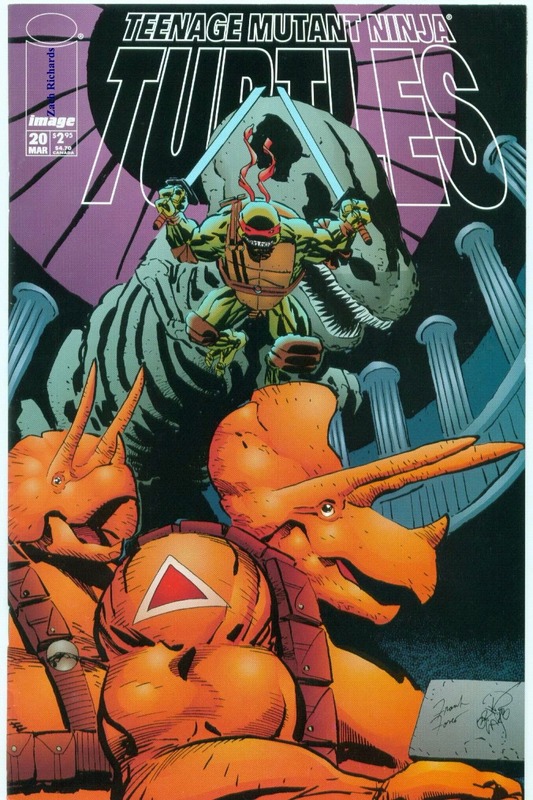 Regardless, the Triceratons just seem to sum up the weird world of TMNT. Just think, within a few issues of fighting street gangs, the Turtles were in outer space confronting alien dinosaurs, and that’s okay. Many of the later additions to the canon, especially the animorphs created for the toy line, just seemed silly to me…but I never viewed the Triceratons as cutesy playthings for dumb kids. Finally, I should mention one line of dialogue in the issue that intrigues me. Donatello casually tosses it out there that Dragon invited him to join the S.O.S. during its early days. It’s a decent example of Gary Carlson playing shared universe continuity, but it also raises an important question -- why weren’t the Turtles in the S.O.S.? Since Larsen was overseeing their Image title anyway, I doubt he would’ve ran into any legal issues. Would it really hurt to have one or more of the Turtles join the team, if only for the sake of one Savage Dragon story arc? It would’ve been a nice advertisement for their ongoing series, and an excuse for Larsen to draw the Turtles again. I wouldn’t want to endure the CyberDonnie design in yet another book, but having a character like Leonardo join could’ve been a lot of fun. Pizza-Free Summary: Leonardo learns that Leatherhead’s captor is Lord Komodo’s “half-brother,” King Komodo. He kills Komodo’s monitor lizards, but is too weak to prevent King Komodo from biting off his hand. Komodo uses his ability to control reptile minds to convince Leatherhead to attack the injured Leonardo. Meanwhile, Casey Jones feels guilty for not following Leonardo and convinces Michelangelo to join him in the sewers. They eventually discover Leonardo and knock King Komodo into the water. The current drags him away, which allows Leatherhead to return to normal. Casey Jones picks up the bodies of the dead monitor lizards and declares that he’s going to collect the reward for the "sewer monster." 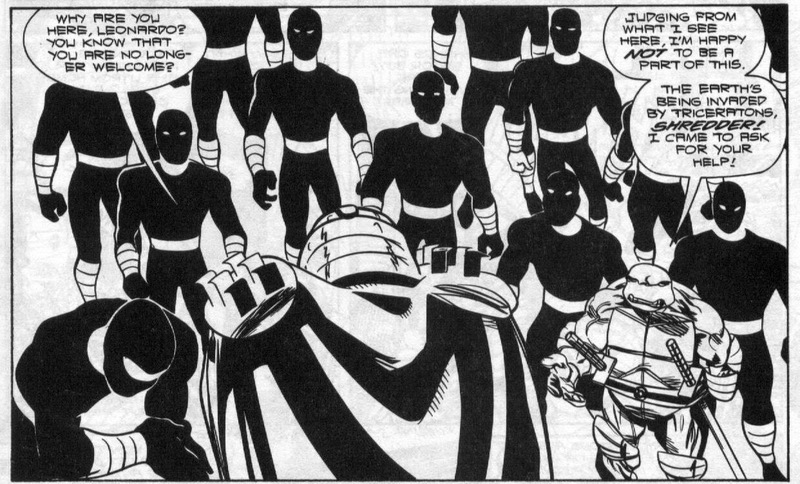 Elsewhere, the original Shredder’s elite guards spy on Raphael, and Donatello is confronted by men in black after he returns to the mausoleum. 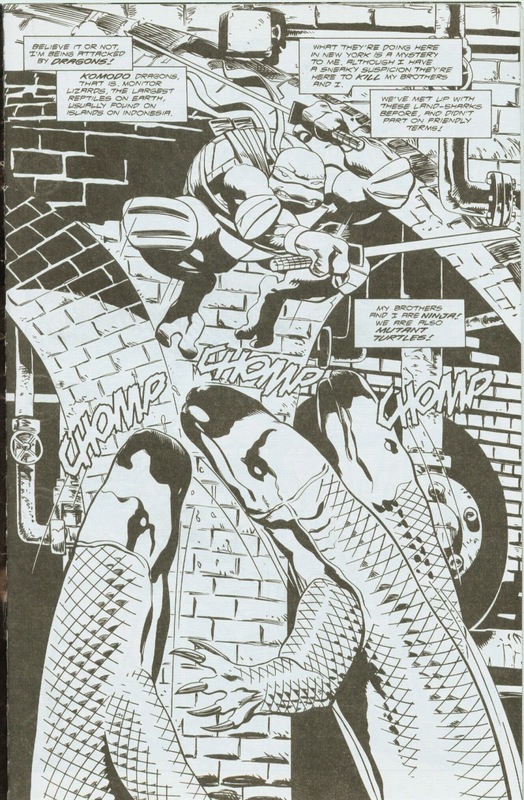 Continuity Notes: King Komodo is a monitor lizard that was mutated by the Dragonlord back in issue #5. It survived the destruction of Dragonlord’s base and was discovered by Pimiko. She “tutored” King Komodo and sent him to New York to draw out the Turtles. King Komodo captured Leatherhead after he discovered Komodo’s plan and attempted to contact the Turtles. Production Note: Even though the cover date says October, the letter column gives a “Happy Holidays greeting” to the fans. Using my keen detective skills, I’m assuming the cover dates are now two months behind the actual ship dates. Review in a Half-Shell: Okay, did we really need a second gigantic Komodo dragon character? Or, more importantly, another physical alteration to one of the Turtles? This is actually a solid action issue, continually raising the stakes and putting Leonardo through increasingly thorny challenges, but why are the lead characters constantly getting mutilated/dismembered/scarred for life? The shock value wore off after the first issue, and it seems unlikely that removing Leo’s right hand is going to lead to stories that couldn’t be told with the already maimed Raph and Donnie. It’s a basic conceit of the Image run that the Turtles have to constantly change, granted, but why does this always have to be a physical alteration? I don’t think the creators understand that the original interpretation of the Turtles is just as iconic in its own way as the classic interpretation of the Fantastic Four. You might play around with the visual for a few issues, but ultimately, the toys need to be returned in their original condition. I suspect that the environment of the times, with the Turtles already being dismissed by many as a fad, lead to the belief that the Turtles were due for a reinvention, with nothing sacred and everything on the table. This does add some drama to the stories, true, but as the years have shown, there is something special about the original interpretation of the characters. When three-fourths of the Turtles are now missing body parts, scarred, and/or a cyborg, the book’s moving further and further into What If…? territory. And as entertaining as What If…? could occasionally be, everyone knew those stories weren’t properly “real” -- when too many of the traditional rules are broken, the stories take on a surreal quality that prevents the readers from making a full investment. The continued carnage is also a curious choice, given Carlson’s instincts as a writer. Carlson doesn’t write dark, brooding heroes, so the gruesome changes made to the Turtles during his stories seem that much more capricious. 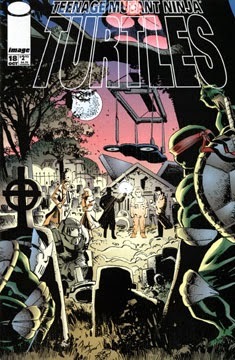 Pizza-Free Summary: The Turtles investigate a security breach at their mausoleum base, but discover only rabbits. Unbeknownst to them, someone has spotted the Turtles and called men in black suits. Leonardo offers to go with Raphael and help train the Foot Clan, but Raphael refuses, declaring that the Foot can only have one leader. Later, Donatello flies to Pittsburg to get supplies while Leonardo visits Michelangelo at his apartment. On his way there, Leonardo is grazed by hunters who have heard stories of a giant alligator in the sewers. Leonardo soon reconnects with April, Casey, Michelangelo, and Splinter, who is recuperating at the apartment. Irritated that the others have reasons for not investigating the alligator, Leonardo goes off on his own. 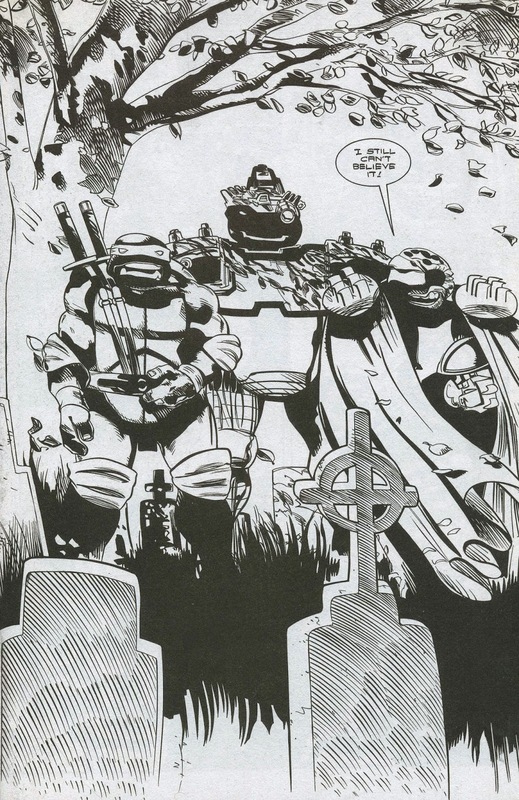 He passes the bodies of several dead hunters while searching for Leatherhead. Inside the Turtles’ old lair, he discovers Leatherhead is being held captive by a giant Komodo dragon. Continuity Note: The shadowy figure spying on the Turtles back in issue #12 is revealed as a portly, nerdy man named Porter. The “men in black” he’s brought to the mausoleum are presumably Men in Black, but without the Marvel copyright, of course. Total N00B: I wasn’t aware of Leatherhead’s origin from the original continuity. A baby alligator transformed by mutagen and raised by the Utroms -- all this time, I thought he was a Cajun magically transformed by a swamp witch! I Love the '90s: Leonardo jokes that one of the hunters that shot him was Charlton Heston. Review in a Half-Shell: It turns out Bat-Splinter was “illusion of change” after all, which is a welcome relief. It’s not as if any grand point was made by mutating the character, although the change did add some drama to the series and lead to a nice sequence in the previous issue. The story seems to have run its natural course, and Frank Fosco usually does a fantastic interpretation of “classic” Splinter, so I’m glad to see him back. 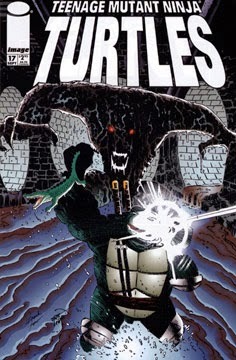 Gary Carlson has fun teasing the reader with Splinter’s fate for the majority of the issue; opening with the Turtles overlooking a graveyard, and later having them discuss what to do with Splinter’s things…it makes the revelation that Splinter’s living with Michelangelo now that much more of a relief. 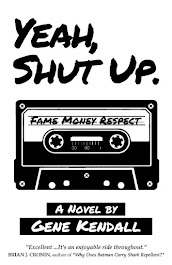 Playing little games with the reader, and playing them fairly, is something I can appreciate. Erik Larsen used to do bits like this regularly in Savage Dragon, and if this is one way Larsen can influence the book, that’s great. While Carlson takes care to touch base with every member of the cast, the issue is truly a Leonardo character piece. Leo might initially seem to be the least interesting member of the team, as the stoic leader he rarely receives the spotlight, but Carlson has a decent take on his character. Leo is used to giving orders, and doesn’t really know how to respond when his brothers don’t seem to be listening anymore. Raphael is (bizarrely) leading the Foot Clan now and doesn’t want his help, Donatello isn’t his old self, and Michelangelo is busy writing his book. To make things worse, Casey Jones has to work the night shift at the supermarket. No one’s available to go mutant alligator hunting! Leonardo’s not necessarily arrogant, he’s just used to getting his way and has a hard time adjusting to change. Carlson could’ve easily played Leo as petulant or unlikable, but he does a credible job of keeping Leo in-character and not entirely unreasonable throughout the story. Unfortunately, there’s another random dialogue exchange in the issue that drives me nuts. What’s Ralph's exit line before going back to the Foot Clan? “Enough reminiscing about the old days! I've got to organize some crime!” So…Raph is going to allow the Foot Clan to remain a criminal organization? They’re still arranging assassinations? And he’s telling this to Leonardo?! I realize that the original B&W Turtles aren’t as a clean-cut as the other interpretations, but surely they’re not rapists, murderers, and thieves, right? The mind boggles. Looking over the scene again, it’s possible that this line of dialogue is a joke, but there’s no real context to identify this. (Actually seeing the Turtles choose to fight crime during this run instead of getting drawn into fights also would’ve provided some needed context.) Plus, the question of what exactly Raphael plans to do with the Foot hasn’t been addressed yet, which is a rather glaring omission in retrospect. Yeah, this could’ve been a joke, but one line of dialogue shouldn’t take the reader out of the story so severely. 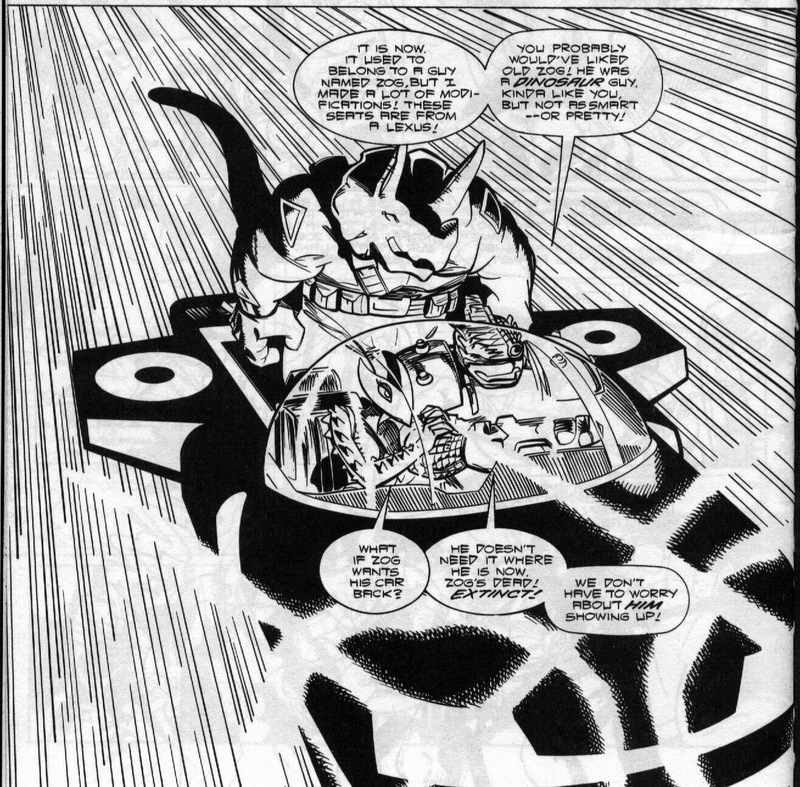 Summary: The Ghost Panther attacks the plane taking the captive ‘Ro from Japan to Wakanda. ‘Ro awakens in the Genoshan underground. Lockheed, who has secretly followed her the entire time, is there. Callisto and the Ghost Panther explain to ‘Ro that’s she’s needed to stop Perfect Storm. Meanwhile, the X-Men meet inside the Starjammer in Summers Cove. Shadowcat reveals that she traveled to Japan to find Wolverine’s clone. 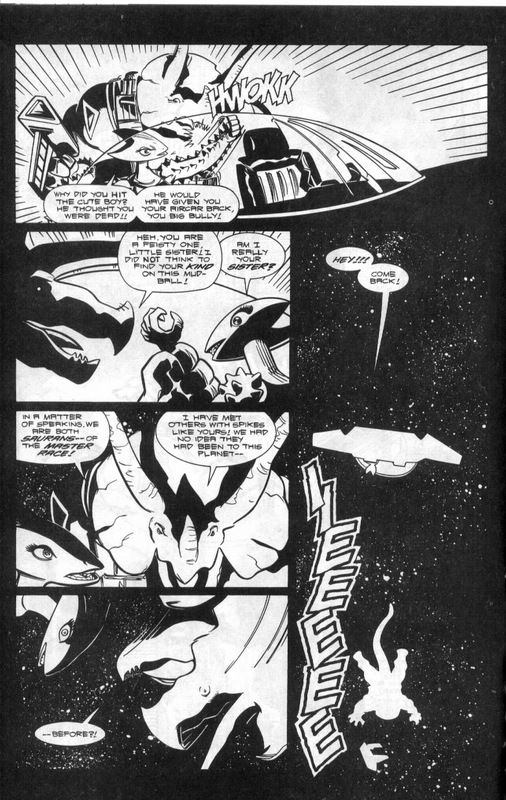 Using the Starjammer’s technology, Havok tracks ‘Ro to Genosha. The narrative captions refer to Ghost Panther as a “he” -- which is a cheat given future revelations. Havok says that he’s still officially a Genoshan magistrate, which will enable the X-Men to search Genosha for ‘Ro. Whether or not Havok and Polaris are supposed to be members of X-Factor in this reality is never clear. Creative Differences: Apparently, the originally solicited cover for this issue was scrapped and used in issue #13.
Review: The glacial pacing has returned, even though the title is only a few issues away from cancellation. Almost half of the issue is devoted to getting ‘Ro from Japan to Genosha, all to learn that she’s to play an unrevealed role in the next issue. The opening fight scene with Ghost Panther runs a little long, but that’s somewhat forgivable considering Claremont’s using this opportunity to sell the ruse that Ghost Panther is somehow a resurrected Black Panther. 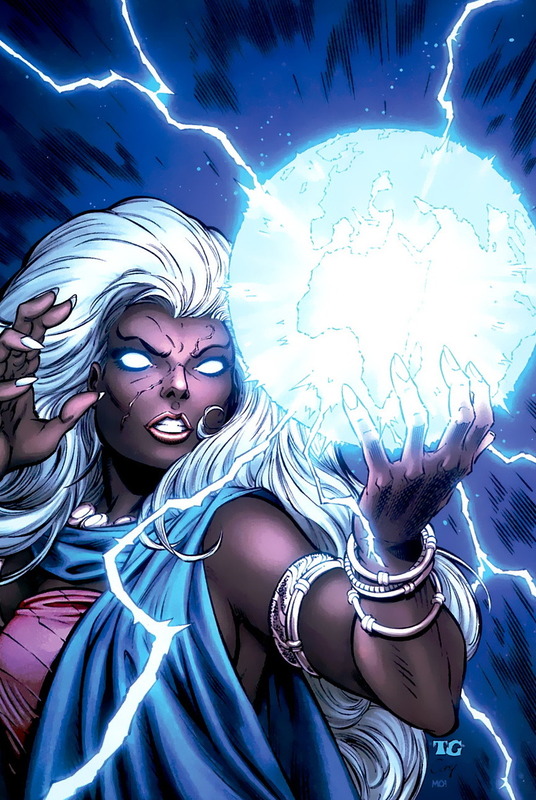 But the pages wasted on ‘Ro being shackled for no reason by the Morlocks in Genosha, and then escaping and sneaking around their base, are inexcusable. Ghost Panther, Callisto, and the Morlocks are on ‘Ro’s side. That’s made clear in the opening scene, then repeated explicitly by Callisto after ‘Ro is “caught.” There’s no reason for her to be shackled, other than to kill a few more pages before the issue’s over. And the pages that aren’t devoted to ‘Ro consist of the various cast members talking about ‘Ro. 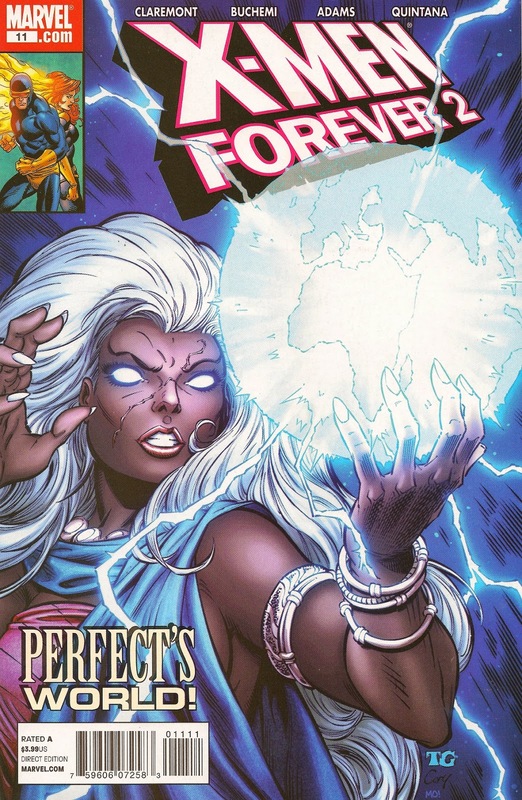 Numerous pages in the story are spent on Perfect Storm in Wakanda and the X-Men in Alaska discussing events we’ve already seen, developing theories, and then making plans for the future. The most grating scene has Mariko condescendingly mocking Perfect Storm for losing ‘Ro, since Claremont has somehow decided that Mariko should now have the White Queen’s speech pattern. Even if Claremont intended this to be a possessed, brainwashed, or evil doppelganger version of Mariko, this wouldn't be any less annoying, since the title has already seen so many “evil” versions of established characters suddenly appear. The only genuine human interaction in the issue comes from Shadowcat’s revelation to the team that Sinister made a Wolverine clone, and even that seems needlessly melodramatic. (Surely the X-Men are used to the concept of cloning by now.) It’s not as if Claremont hasn’t already set up around eighty other plots in this title so far; maybe a few of them could’ve received this attention instead?